The project is an addition to an existing wood frame and clapboard, two-story English Revival style built in 1938. The project involved major excavation to create a new driveway and lower level garage on the site-and to carefully maintain several large specimen trees. Major new spaces include a garage, living, kitchen, and dining area, an exterior courtyard and terrace, as well as interior renovations to the existing house. 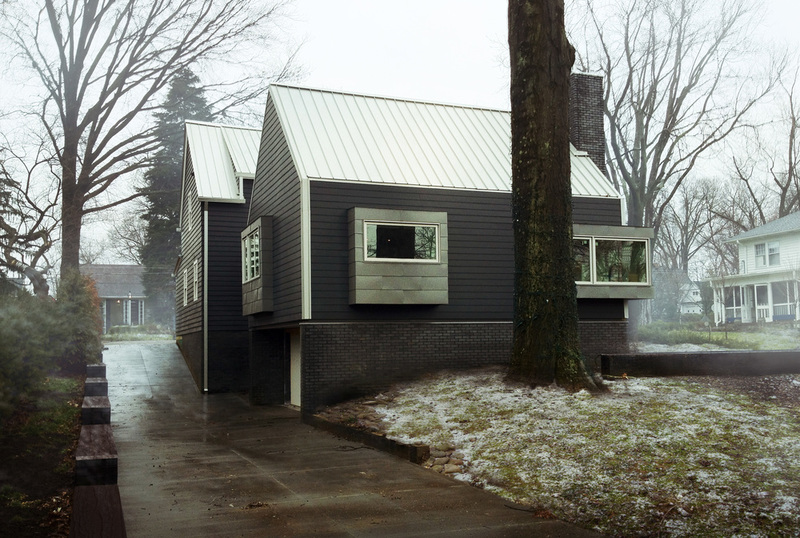 The material palette is comprised of charcoal colored cement fiber board cladding; zinc clad window and door projections; zinc standing seam roofing; clear anodized aluminum high-performance operable glazing units; and a chimney, foundation and retaining wall cladding of dark gray ironstone brick. The existing house is located in an Architectural Design Review District, which necessitated a series of intense and often contentious design reviews and public debates. While our strategy involved a close reading and interpretation of the existing forms, materials, details and scales of the context, the review board pushed for replication. Although the design was finally approved by the board, it was immediately appealed by neighbors, forcing the project to undergo a city council review, after which the design was ultimately approved.